It’s almost that time of the year again. The day to celebrate just how amazing Mums really are. They do everything for us, even when we’re well past the age of needing it! For this reason, we wanted to help you make your Mum feel extra appreciated this Mother’s Day. We’re giving away a Deluxe Golden Tower to one lucky winner! 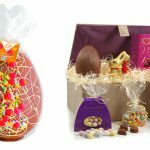 Just enter via the widget below to be in with a chance to win this extra special treat for your Mum. This whopping tower is packed full of wonderful treats for your Mum to enjoy this Mother’s Day. 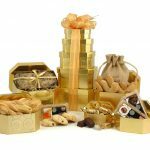 She will love discovering the impressive selection of delicious sugared almonds, lemon cookies, chocolate and so much more. Each shimmering golden box houses something new. 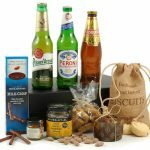 To see the full list of contents in this hamper, click here. The competition will close at 3pm on Friday 2nd March 2018. 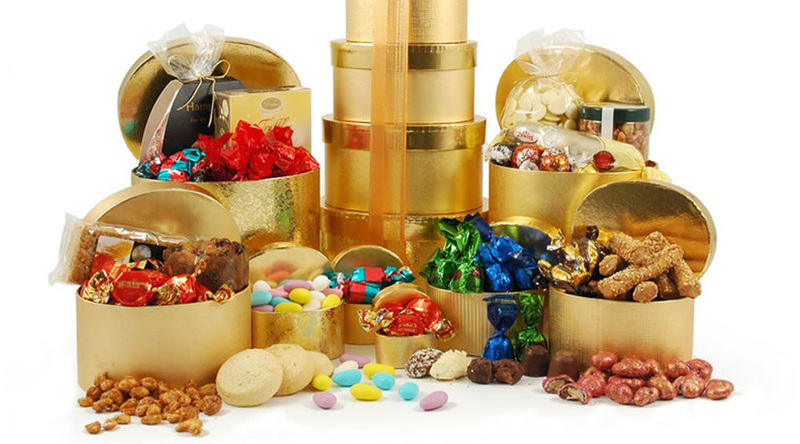 Share your favourite Christmas treats & win a Christmas Hamper! Know Mam she would shatre it width all the family.Heart of gold she has. My mum is mine so there is no comparison. My Mum is amazing. My sister went off to live in America over 10 years ago and left her daughter and son in the UK. Means if they want anything doing my Mum has to run about looking after them and making sure they are OK. Unfortunately my sister doesn’t have the manners to say “thank you” and the only time she rings/contacts us on FB is when she actually wants something. It now doesn’t help that my Dad had a fall 2 weeks ago and broke his hip, so my Mum is running backwards and forwards to the hospital . (I hope I can nominate a mother figure very close to my heart) She is a treasure, devoting her time to help others. But best of all the greatest GRAN! Because though she is 79 years old she has been fantastic since my MS diagnosis.encouraging, motivating always researching alternatives, help and tips and putting up with my frustrations, fear and anger. My mum is amazing as she a;ways puts others before herself and is the kindest most caring person I know. My mum is selfless and caring. I would love to treat her! My Mum beat sepsis this year so she deserves a treat. She would love the Lindor truffles. OMG my mum would be so surprised if this was delivered to our house!! She is always so supportive and caring and helped me beat anorexia! She’d love the lemon butter cookies!! My Mum has always been kind, caring and sharing. That was how she was brought up to be, when young the family did not have much, neither did the neighbours, etc. It was a time of knowing each other and looking out for each other. Times have changed. I can recall when young and my Mum happily accepted and welcomed our friends. She had friends who visited, we visited family and friends. We even had times when people stayed over, or stayed sometime and became part of the family. We don’t have so many visitors now, many gone. Some too frail, etc. Yet we continue to love them. Younger people tend to be busy with work and their own pursuits. Mum loves to share sweets and treats with family and friends. Some persist with visits, though less frequent due to commitments, health, etc. Quality of Time is Valued and to be Treasured. My Mum we Treasure, and she deserves a Treat to Share. I’m 37 weeks pregnant and my mum has been so supportive throughout my pregnancy. She definitely deserves a treat as I have no doubt that once baby is here she will be equally as helpful! For looking after us all and never thinking about herself – A Golden Tower would be a treat she couldn’t ignore!! She works hard for her whole family and never takes any “me time”, in fact she’d probably say “what is that?” – so I’d love to treat her and show her how good me time can be! My Mums been through such a lot in these last few years. But even during some of her harder times, she’s always been there to support me through my own highs and lows. She would absolutely adore this prize as she loves sweet things! She’s not just a mum to me she’s also my carer and she’s amazing i wouldn’t be here without her. My mum has amazing patience and is great with her grandchild. Her little treat has always been chocolate and a diet coke. Mu mum is wonderful and has always put the family before herself and she has been there for me however she felt. She certainly gave unconditional love. She’s been through so much aswell and still never ever puts herself first. My mum is amazing because she is so caring! My mum is the loveliest person i know. She always visit elderly people who lives alone and make them a cuppa and have a chitchat! she always has time for others! so kind! she’s mine and deserves a treat! Love my Mom! She is the best! My mum is no longer here but she was amazing she was lame but worked full time and looked after her parents too. I would love to win this and share it with my daughters who are both great mums as well. She’s super mum (or nan) at 73 years old she has just completed high ropes course at Go Ape and zip wires – she lives life to the full! My mum is amazing and deserves to win this s she has always been and is always there for me. She raised me and my sister on her own after my dad walked out when I was only 6 months old. It was a tough few years and she often went without so me and my sister could eat. This looks fab! What a great giveaway! She always puts everyone before herself, and she would love this because it’s such a special treat! My Mom is amazing! She went through so many things and she is still positive and smiling! My mum has been such an amazing help to me this year and would absolutely adore this hamper. It’d be a treat for her and something she’d share with the family. The Belgian Chocolate Hazelnut Pralines sound utterly divine!! My mum is the best as she is a carer for my dad and never stops!! She deserves a treat! My Mum is literally the sweetest lady in the world. 1 – She loves anything sweet lol and 2 – This woman lives in Australia and every year she will come over to the UK to help me with child care during the summer school holidays so I don’t have to pay for a babysitter! Now how sweet is that? She def deserves something like this to show my appreciation. My mum is amazing so strong and beautiful. If I grow up to be half the women she is I’ll be happy. Diagnosed with terminal cancer last January she is still fighting. Would love to treat her to this to tell her just how amazing she is! Wonderful treats for our mum , thanks for the chance to win with you , super kind ! With great joy and many a tear. With many a cry, and a little moan. I have thrown my food in every direction. While Mummy looks for any protection. My collection of nappies is growing fast. But will my hobby ever last? I sleep at any time I choose. When I awake, Mum’s having a snooze! Looking after me, it’s no surprise! Yet her love has never gone astray. I wish I could repay her everlasting love. Maybe a ‘Deluxe Golden Tower’ can answer the above? My mum is not just a mum to me but also to everyone around her – always caring for others helping people and having fun. If I end up half the mum she is I would be happy! Amazing woman! My hero! Great prize, me (I’m a mum) and my MIL would love to share this…yes share, it wouldn’t be right to let her eat it all on her own haha! My mum loves like she has never lost which makes her an absolute superhero in my opinion! I wish i had her courage and kindness to forgive and forget when many people have done her wrong. A mega sweet treat like this would just be a small token of how much she means to me and how much i value her morals and way of thinking and acting. My own Mum is no longer with us, but my second ‘Mum’ deserves this treat simply for being there for me. My mum is a supportive, caring role model, my friend forever and generous always putting others before herself so it would be lovely to treat her and just between you and me she has a secret sweet tooth hehe! My mom helps me out so much, still looks after so much whilst I am at work she organises plumbers, elections and builders so my life does;t fall apart. Because she has always been my best friend and taught me to be strong and work hard for what you want. She has helped me through 2 spinal operations and a knee reconstruction. She was my nurse, maid, councillor, cook but most of all my best friend through it all. She wouldn’t let me feel sorry for myself and pushed me so I healed faster and stronger. She really is amazing. Oh, wow. This looks amazing. Because she’s non-judgemental and always treats her kids but never herself. My Mum’s always there for me and my Daughter, we’d be lost without her! My mum is so selfless, always putting others first, would love to treat her, Melting Pot Cranberry & White Chocolate Fudge sounds amazing! Such a great selection of Pralines and Truffles etc, my mum would love this. I love my mum because she’s the best mum in the world!!!!! My Mum is so amazing because she always has a kind word to say about everyone. She never judges anyone and is always kind, loving and caring. She is totally the best and deserves an enormous treat. My mum is the most amazing human being in the world. She’s always been there for me and whenever I needed advice or help she’d be there offering it, but also giving me the space to learn from my own mistakes. I’m everything I am today because of her and when I try to let her know she just says she’s my mum and it’s nothing! My Mum’s a tower of strength and finds the positive in even the worst of circumstance. She is a no-nonsense kind of woman but is kind to everyone and never has a bad word to say. She always shares all her goodies with me and the children and it’s only fair we win her something this amazing to repay her generosity! My Mum is amazing for the way she takes care of my Nanna, who has dementia. She’d love this treat because she and my Nanna both have a sweet tooth! My mum really deserves a little luxury and indulgence after caring for me through both my transplants. This would be the perfect way to spoil her! My mum is not only my mother but also my best friend and my rock. After suffering years of multiple miscarriages and fertility treatments I became pregnant with my daughter. My mum stood by me helping me when I couldn’t help myself. I was so weak and drained out but she was my strength. Our precious daughter is now 5 years old and her bond with my mum is incredible even though we live away, her Nan is a biggest supporter and I would be delighted to be able to gift this to her as a way of saying heartfelt thanks for everything she does for me and my daughter. I only have a mother in law now but she is fab. She is 87 and always on the go, helping people much younger than herself. My Mum deserves it for putting up with me! My mum is sadly no longer with us and nor is my other half’s mum but my other half’s step mum is awesome and I would love to win this for her. She is such a good grandparent to our two little ones! My mum is so awesome as at 50 shes just started travelling all around the world, and making me very envious! It’s made me realise you really do have to follow your dreams and live in the moment. My wonderful Mum is no longer here, but I would love to give this prize to my daughters and daughter-in-law, who are fabulous Mums and make me very proud. 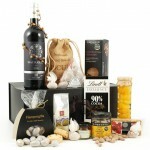 Sadly my mum is no longer with us but I would love to give this delicious hamper to my daughter. I don’t drive so she often drives me to work and will pick me up again (on her days off) and quite often she arranges her own days off to coincide with mine so we can go for a nice drive and day out somewhere. She works in the dog kennels looking after the RSPCA dogs who have been abandoned and badly treated and I know it gets to he sometimes. I think this hamper would be a lovely way to cheer her up. My mu drops everything to come and babysit (300 miles away) when we haven’t got any other options. Mum is amazing , she still runs around after us . her adult children . She always has time for her Grandchildren and even cooks meals for elderly neighbours . She was just born to mother people . This would be nice treat for my wonderful mum, she has been a tower of strength for my 2 boys & myself for the past 19 years. She just seems to be indestructible & tackles everything head on & seems to find a solution for everything. The amount of great advice she has given me & the rest of our family has always been very comforting & reassurance. Sadly my mum passed away a few years ago but I would love to win this for my mother in law as she’s been amazing and deserves a treat. My mum is such a credit to our family. I don’t know where we’d be without her! I’d love to win this for her as we both have a sweet tooth. My mum-in-law is wonderful – when my own mother died she simply swept me up and adopted me into her family, no fuss, no embarrassment, and gave me the sense of belonging I needed. She made my loss more bearable by her generous and kindly actions, and she gave me back a family. My mum is a chocoholic so this would be perfect for her. But she is the most wonderful mum. She hqs always been there for me and my siblings no matter when day or night do so deserves a treat. She is the most Kindest, Loving person i have ever known! she would absolutely love this! Sadly I lost my mum when I was very young, but I’d love to win this for my daughter. She is a fantastic mum to my little grandson and I think she deserves – as all mums do – a special little gift for herself. My mum’s the best mum you could ever wish for. She’s also the best grandma in the world, she never stops looking out for all of us and is the heart of our family. My Mum deserves this because she is always there for me with loving advice and support when needed. She is a fantastic Mum, Nan and Grandma. Even when she is in bad health she still always puts others first. I wish I could Strike GOLD! 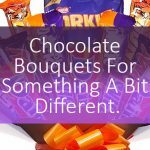 My mum would love this as she loves sweet things. My mother is not around any more. But she would of loved this . My mother in law does only care for herself. So she can be gifted to anyone who wants her. So this gift I would give to a friend that helps everyone. But she’s a single mum and hardly anything to her name . Shes always been my number 1 fan!!! My mother passed many years ago, but I would like this for the mother of our children please. My Mum had major brain surgery and was determined not to lose herself, she re-learned to drive and never gave up fighting. Always an inspiration. My Mum is wonderful. She will do anything to help any of the family. What a fantastic competition prize to offer and so very generous of you. Thank you very much for the chance to win. My Mum is pretty amazing for giving birth to 8 of us and always being there for us throughout our often chaotic upbringing. My mum is having her second knee replacement within a year soon, so she would love this whilst recovering! I’d love to win this for my mum. We live opposite ends of the country so don’t get to see each other very often. She loves chocolate so I couldn’t think of a better gift than this! It’s amazing. My mother in law deserves to win because she’s a very lovely person. My mum deserves this as she has stood by me when nobody else did and pit up with my c**p for far too long. Also she loves sweet treats so would love this. She is my best friend and perfect for going shopping with! My mum was an amazing woman, who lived for her children and grandchildren. She would do anything for anyone and was always putting everyone before herself. Sadly she passed away a year ago and I miss her more everyday. If I’m lucky enough to win this I’d give it to my sister who is, just like my mum an amazing mother to her daughter and great auntie to her twin sisters, (who also passed away 3 years ago) 4 children. She deserves this special treat. She has always been supportive of my choices even if she clearly does not agree with them! My Mum is ‘Mum’ to the whole family she’s always there looking after everyone else and asking for nothing in return even though her own heath isn’t great, she really deserves this treat. My mam is amazing as she is so thoughtful, kind and patient. She would love the Deluxe Golden Tower as it looks fantastic. I am sure anyone would think it is a brilliant treat. My Mum is the best she is always there for us to help out in anyway she can. My mum is so amazing as she will do anything to help anyone. Why is Mum so amazing? Because she raised ME! …and she STILL puts up with me, despite my many, many, MANY faults. My mum is always doing things for other people and it would be nice to give her this Deluxe Tower as a well deserved treat. Sadly my mum died a few years ago but i have the most amazing mother in law who is more like a best friend. We even travelled Australia together for her 73rd birthday! Very simply – she has ALWAYS been there irrespective of the highs and lows, it doesn’t get better than that! It would be lovely to treat my mum after all she’s done for me. A GREAT GIVEAWAY FOR ANYBODY. My mam is my best friend, taxi service, babysitter, school run buddy, zumba partner, the list goes on and on. I wouldn’t be me without my mam she is just my whole world and I can talk to her about anything and I know she can keep a secret! My mam doesn’t realise just how much I love her and how much she means to me. I spoil my mam whenever I can and she’s always so grateful – She totally adores my 4 children and they absolutely love their nana endlessly. My mam is my one in a million and my tower of strength and I will always be here whenever she needs me! I know my mam would love the Deluxe Golden Tower! She is a chocoholic just like me and maybe she would share with me too! my mum despite being in her 80s does my ironing because she loves that chore! Leave a comment on this blog post telling us about why your Mum is so amazing and why she would love the Deluxe Golden Tower! My mum deserves it she has had alot of problems to sort out. My mum is amazing because she always puts others first. She helped me raise my two teenagers when my husband walked on , when they were babies. She taught me to be strong and believe in myself and anything is possible. Kind hearted, strong, protective, the best. My mum is no longer with us but my sister has been my support, confidante and best friend over the years and I would love to show her how much this means to me by winning her this fabulous prize! Cooks like Deliah. Gardens like Titschmarsh. Knows enough about everything to rule unchallenged at Trivial Pursuits. Raised four kids. Went back to Uni during the death of her mother and divorce. Aced her degree and went back to work after decades of being a home maker. My mum sadly has dementia and is in a care home. She would not fully understand the gift if honest . The care home do a marvelous job looking after mum, she can be quite difficult and aggressive sometimes with the illness and more than once has managed to escape!!!!!! I would give it to mum AND the care staff to share just to say thank you from her four children from our as we so appreciate what they do. That pile of stuff is amazing. My mum has just beaten cancer and has also struggled with losing her grandson but she was a rock for everybody through it all. Kudos to all the strong mum’s out there . My mum is amazing because she always thinks about us and our families first. But more than that my mum still knows when I need a hug, even when I don’t tell her. My mum is caring, loving and wise. She will love the prize and will share with all her friend. My mum is amazing, because she’s always been there for me and been ready to lend a helping hand. well here’s hoping she does share ! My mum is no longer with us but I have the most amazing Mother in Law whom is always there for me if i ever need her. My grand-MUM TOWERS above everyone for her constant support and love. She puts the SPARKLE into my day and the LOVE into my heart. my mums amazing. brought me and my 2 sisters up on her own, shes always been there for the 3 of us through everything, including the loss of my baby almost 13 years ago. she has suffered with her health quiet a lot over the last couple of yeara and is in pain every single day but never complains. she truly is my hero snd sure as hell could do with a nice treat. If my mum was still with us, she’d be so happy to see everyone enjoying this super prize. Always has an answer for everything! My mum deserves this for caring for my brother even though she has a fracture in her spine herself.I know she would share this with everyone as she always shares. My mum is so sensible and level-headed, giving great advice & talking sense. She’d enjoy sharing this with all her friends & her grandchildren! What a delicious and amazing prize – my Mum would love it and hopefully share it! cos she is mine and i love her loads! It’s a lovely gift for a lovely mother. My mom always takes care of me in new and surprising ways. At 75 and after haviing a stroke my mum still makes crafts to sell for Macmillan cancer support. She is one in a million who goes out of her way to help others and I’m sure if she received this she would give it to her charity group to raffle off well apart from some fudge (her favourite) She is funny, knowledgeable, and very patient, a true lady. This looks like such an amazing present! Sharing would be hard. My Mum lives away but is always at the end of the phone if I need her and she loves chocolate! My mum is amazing because she does so much for me and my sister, and shes the only person that can bring a smile to my face on those bad days we all have, she’s not just my mum and carer but she’s my best friend! Lovely lady, very happy and brilliant at everything..
My mum is totally selfless, always putting everybody else before herself. If they are happy then she is happy. She really does have the patience of a saint, believing it is more important to find the reason behind someone’s unacceptable behaviour, rather than reacting to it.My sister and I do try hard to follow in her footsteps so rewarding her, with this tower of many of her favourite chocolates, would demonstrate our love for her. My mum is amazing because she just never gives up. She had a huge heart attack at the beginning of February, but powered through it and is now making a full recovery at home. She never once complained and takes everything as it comes. My mum is sadly no longer with us. Hope I can still enter. Sadly mum died when I was 12. But I have a friend that has been like a mum to me. She has helped me through the hard times and laughed with me through the great times. At the age of 13 when my granny died and left my mum the eldest of 5 she has looked after and brought up those four siblings to be beautiful aunties and uncle to me and my family, sisters and brother and relentlessly given her knowledge and time to help us in life without questions or negative thoughts. Everyone that has the pleasure to meet her is a friend forever. I know that her one vice in life is anything sweet so this would be especially nice for her to receive. Just a little of what she fancies for a change. We all love her dearly and she deserves to be treated. She’s always there ready to help out. She would think this is a real treat. My mum is not amazing, she abused me and my father abused my sister, but I’d like to win the chocolate. all mums are fantastic for bringing us into this world. my mum is always there when I need her. My mum is amazing and always thinks of others before herself. She deserves to win as she would love this prize. i’ve never known someone else to show such unwavering patience in the face of utter chaos. choc and fudge are her favs. My mum hasn’t spoken to me for 18 months now. My fault to be honest and I feel so guilty. This Mums day I’ll visit with a huge apology under my arm. Hopefully with this beautiful prize too. My loving mum is in her eighties now and she worked hard through her life to provide for us – often sacrificing her health and happiness. She is always ready to help me. She is my best friend, great babysitter and my fashion and cooking adviser. She taught me to believe in myself and never to give up. Thanks to her I am who I am today. I would love to treat her to this special gift on Mother’s Day. My mum is my hero. She is my mentor, my rock and my support system. She has been nothing but influential and the centre of my universe. She never fails to put a smile on my face and inspire me to greatness. She is the strongest and most incredible woman I know. My mum is amazing as she is my rock and is always there for me. Firstly, my Mum is caring & supportive as she works long hours for the NHS and is dedicated to her job. She is loving and has a fab sense of humour. 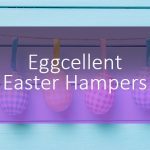 She would love this hamper as she enjoys a sweet or chocolate treat and an energy boost! She is always there for me and my family! My mum has always been creative and resourceful. My Mum is always so positive and supportive! She loves anything sweet! She is amazing, she brought my brother and I up when our Dad died in an accident when we were young and these sweet treats would be such a treat for her as she has a sweet tooth! My mum is always helping me and is great with her grandchildren. My mum is my inspiration, she is a strong and loving mother/grandmother. I couldnt ask for a better person to call mum. This would be for my grandma as I lost her daughter/my mum and so she will be a mother’s day gift short this year. My Mum is brilliant: great sense of humour, really generous and always there for us all. All mums are amazing. I’m going to nominate my wife because she is the most wonderful mum to our girls. She has been unwell recently and struggling to cope, but she’s managed to keep things going all the same. When my mum looked after all of us six children, Bathing, feeding, dressing and generally making sure we were all ok. My mum is amazing. She will be 80 this year and is a carer for my father. She has problems of her own but her first thought is to make sure he is ok. She’s a real trouper and says “you just do what you gotta do”. Luv my mum so much. Go mum – I hope I’m as strong as she is and this is why I feel she deserves the Deluxe Golden Tower! My Mum is sadly gone but my my daughter is wonderful and I would love to win this for her. Mum’s amazing because she has gone through so many health conditions with me from Meningitis twice, life threatening asthma attacks to the chronic illness I live with on a daily basis. All through that Mum has always stood by me never once has she wavered I just wish she had not of gone through it all. My Mum’s 92 (despite being a heavy smoker) but still has a saucy sense of humour. She’s housebound now so amazing treats like this delivered to her door would really make her day. Would love to give this to my mum! She is super mum – always been able to balance being mum and dad, and being a very successful businesswoman! My mam is so amazing because at the dear old age of 67 she is still able to enjoy taking part in outdoor persuits and games with her 12 young grandchildren! She would love the Deluxe Golden Tower so she could share it with them! My mum has brought up six children who are all loving, intelligent and well grounded people. And now she is a trusted and hard working Grandma. Mum has always been there for me, encouraging and supporting, even while going through her own problems. Nothing is too much trouble for her and I’m blessed to have her. She’s so lovely that she’d use the ribbon from the prize for her cardmaking, have a couple of treats for herself and give the rest away, probably the majority to me as she insists I need treats due to my health issues! My lovely Mum is 88 and after a battle with colon cancer, she struggles to keep her weight up so we often buy her delicious treats. She has always been a real ‘sweetie’ herself and each Christmas, one of our gifts was always a round golden box, tied with a ribbon, full of our favourite sweets. Back in the 60s, this would have cost quite a bit of her little income from nursing, she must have struggled to do this for us kids, but she always did it, no matter what. She always does her best, is always there for us and is an amazing grandmother. My mum is amazing because she helps me so much with my children allowing me to work. She has looked after them and my dogs recently when our house flooded and we had to arrange alternative accommodation along with essentially managing a building site. It has been very stressful and she has made it so much easier for us. A really delicious prize to win. My Mum is the best because she is always there for me. I have done some stupid things in my life and she has never judged me, she just picks me up and says tomorrow is another day…. Shes great! My mum is simply the best! Her love is unconditional and selfless. I am so Thankful she is my mum and is always here for me. She is so special and would love this wonderful treat! Patience and a wicked sense of humour. Sadly my Mum is no longer with us, but I have a friend who is like a second mother to me. Even to the point of baking me a birthday cake every year. This is in spite of bringing up her own family and holding down a full time job. I would love to give her a treat, and she’s second only to me in her love for all things sweet and chocolatey. 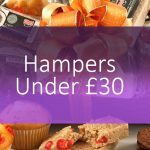 My mum is incredible woman and I’m very proud to be her daughter and she would love this hamper especially the sugared almonds. It would be so lovely to treat my Mum because she is always looking after everyone else. 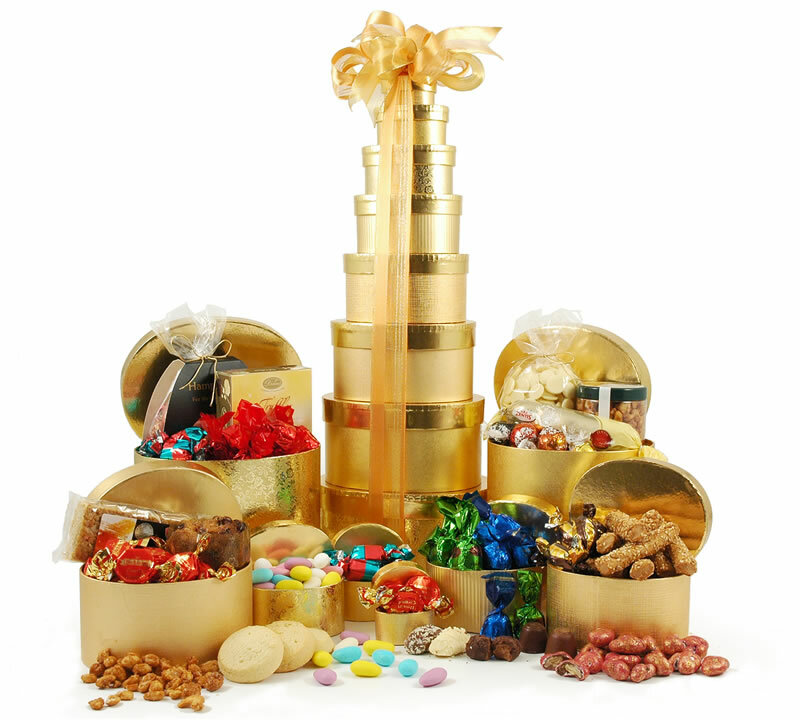 I am so grateful to have her in my life and would love to give her this amazing Deluxe Golden Tower .